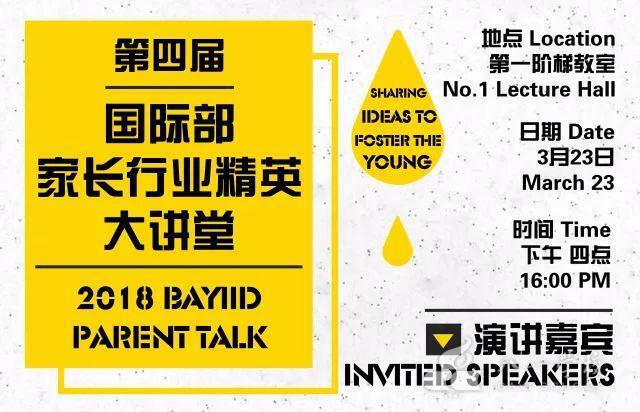 The 4th annual ID parent talk was successfully held on March.23rd at No.1 Auditorium in Beijing Bayi School. As a tradition and signature event in our department, the Parent talk is a wonderful thought-provoking sharing of ideas and experiences that plays a positive impact in fostering the growth of the young generation and our school community. It opens up a way for our students to interact and connect with elite professionals from a diversity of backgrounds in our parent population. It also provides a great opportunity for students to hear and receive valuable advice from experts in different areas, which is particularly useful for those who have the desire to join similar career pathways. This year, we are honored to have invited four distinct parent speakers and had them share with us their inspiring stories and how they contributed to their unique success. After listening through the four distinct speeches, I became really admirable of these true elite parents coming from different professions, and deeply motivated by their experiences towards success which serve as valuable models for us to follow. We students used to think professional career is a distant unfamiliar world and is filled with a lot of unpredictable challenges. But thanks to this parent talk, we were given a chance to be guided into this unknown and to explore the various possibilities we can have in the future. Mr. Yu’s argument that studying builds up one’s own dignity educates us to hold a new attitude towards our current struggling school life: the painfully hard work we are paying now is all for the sublimation of self-esteem and self-value, and will eventually bring fruitful results. Through the sharing of various intern stories at Siemens by Ms Wang, we learned about how important it is to self inspect and reflect in order to maximize opportunities for success. She also reminded us to avoid similar mistakes that fresh interns make at work, which highly merit our students’ attention in school. As students in 21st century, we would never imagine how the academic life was like back in the 1980s. Timely, the third speech by Dr. Dai supplements our knowledge of how the elder generation struggled for study and work in a much harsher environment. Despite the difficulties of striving by oneself as a fresh female graduate, Dr. Dai Hui proved to us with her own experiences that no matter how hard a challenge may seem, it will eventually be overcame by one’s faith and perseverance. The last speech given by Mr. Liu’s South Pole Expedition really caught our eyes. He depicted a picture, in which one realizes his dream when treating the dream as his vocation. Only if the life you have now is what you have dreamed of, you will be able to confidently say that you left nothing behind. Follow where your heart leads you. If it tells you to do so without regret, then nothing is going to stop you.